One year ago I couldn’t swim 50 meters, I did 2.5 miles. One year ago, I couldn’t ride that well. I did 112 miles in six hours. One year ago, I couldn’t run. I still can’t run! I left Toronto via Atlanta on Wednesday morning. 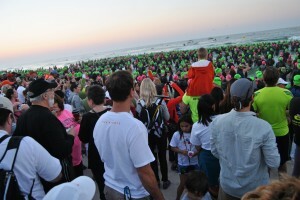 The flight from Atlanta to Panama City was 100% full of triathletes and their family members. So it is all becoming very real. 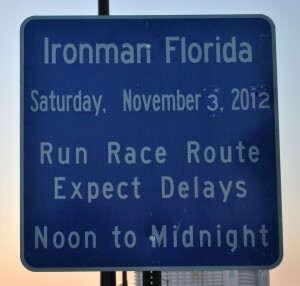 I arrived on Wednesday evening in Panama City not knowing what was in store for the Ironman adventure. My taxi driver Dave was very friendly and was giving me the lowdown on the local scene in Panama City. I asked him if we could get my bike for pick up and how much extra it would cost. He said, “no problem, don’t worry about it.” So the good vibes began! I checked in to my hotel and decided to take it easy for the evening. Planned my weekend check in time, training times, race time, breakfast, welcome dinner etc. Had a great night sleep and ran into my neighbor (next room in hotel) Chris from South Africa. Very quickly we both knew neither had any idea what we were doing. We decided to check in and then go for a 20 km warm up ride. This would be Chris’s first triathlon as well. His friend Greg was stuck in New York because of (Hurricane) Sandy and was given a special exemption for a late check in. Thursday night we went to the welcome dinner. 5000 people in one room. What a special evening. 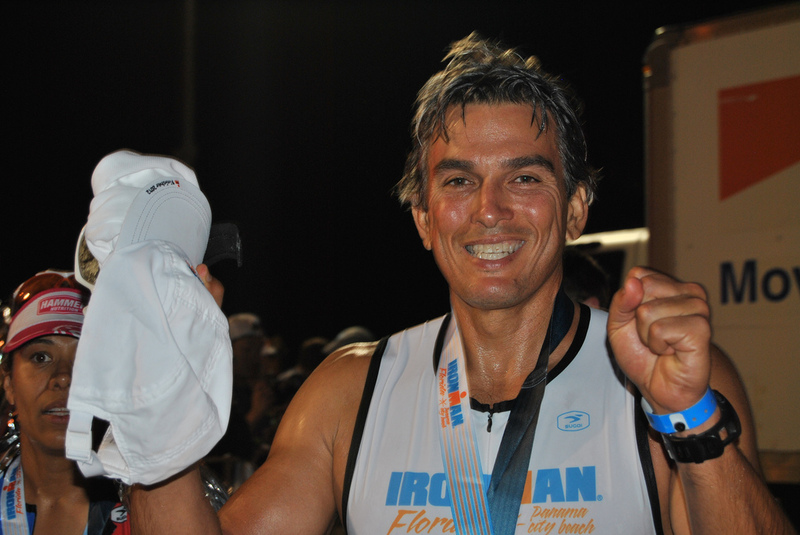 They went through the history of the IRONMAN, last year’s champion spoke, and they asked who had lost the most weight in preparation for Ironman Florida. They started at 50 lbs and finished at 145 lbs! They spoke at length about the good work the Ironman Foundation has done for the community as well. Joe from Miami sitting beside me was very helpful. He had done the Ironman several times. He told me all the ins and outs to look for. He was a tremendous help. The evening wrapped up with an hourlong athletes meeting on the course and rules. Friday, a day of rest and the day to check in your bikes and bags. I went very early to get it over with. Chris was waiting for Greg to arrive from New York and then they would check in together. What a scene, thousands of bikes, finish line prepared, volunteers all over (3000 in all). I listened to a panel of pro triathletes speak about their experiences. They were all easily accessible and took pictures for a long period of time with the crowd that gathered. Then a little lunch and back to the hotel to relax. Went over my plan for the day. Over and over and over again. I was extremely nervous but excited. Along the way people are all telling you about the different stories of the event. One gentlemen got cramps on the swim, crashed twice on the bike and didn’t make the 17 hour cutoff for Ironman. That wouldn’t stop him. He keep going and wouldn’t allow the volunteers to stop him. He was coming into the finish line at 3am when word spread of his story. Over 500 people from the hotel came out to cheer him on, they turned the lights back on the finish line for him and he made it. That’s the Ironman spirit. Race Day, breakfast at 4am and then bike check at 6am with 3000 athletes and forget my water bottles! Don’t panic get some Gatorade and that will have to do for the first 10 miles (there are aid stations every 10 miles on the bike and every mile on the run). Off the start swim. 3000 people entering the water at the same time. The gun goes off at 7am. I finish my first lap in pretty good time and feel good. Finish my swim and feel confident going into the bike. The bike course was a little scary at times. Then halfway through the bike I passed my friend Chris. One gentlemen in front of me dropped his water bottle and almost took me out. We hit a bumpy section and there are water bottles, bike pumps, bikes with flats, Gatorade bottles all over the place. The guy beside me hits a water bottle slides and almost goes down. I was sure to go with him if anything happened. My nutrition is going well and after six hours I am done with the bike. My first mile into the run the winner is coming home. I take a look and think oh my gosh he is not even moving, what is in store for me. I see the second place athlete about half a mile behind the leader. He grabs a beer from a spectator and starts drinking it. Well, that’s my new favorite triathlete! Then you start seeing people just losing it every mile. Walking, sitting on the side of the road, throwing up, delirious but some women kept talking about new fashions when I passed them. At about mile 13 things really started to hurt. But I separated mind and body and kept trotting along. Then it got dark and I thought, “wow, I started in the dark and now it’s dark again.” That is a pretty long time. My next goal was just knocking off each mile. One by one I kept pushing and then it was mile 24 and I said let’s run it home. While running it home that little voice in my head said, “Karl, slow down, it doesn’t matter”. Then the other voice says, “Yes it does matter to you, finish this how you started it: strong.” I came into the final stretch and actually couldn’t believe I had made it. 5000 people yelling and cheering you on to the finish line. I did it! I have thought about doing this since in 1982 when I saw Julie Moss on ABC’s Wide World of Sports. I watched you come across the finish line. Great achievement!!! Brought a tear to my eye. Hope your flight back to Toronto was OK – now back to normality. Good job on the Ironman. See you in Australia when you register for your next one over there!!! I will do it with you. It was a fantastic journey! Like most things in life it’s the people that made it great. Our coaches Nigel and Sylvie, Eon at our bike shop, Geoff Bower and our team for inspiring me. Chris, Greg and Joe along with countless others that I met in Panama City. Most importantly my fantastic wife Maria who was there to cheer me on and support my crazy adventure for the past year. You are an inspiration to all of us who dream but do not follow through. You are motivating me to leave my comfort zone. Thanks. Great job. Well Done!-Hard work for us big boys- the accomplishment is in finishing, curious to know how you feel about the fact that you will never win it – being a competitive guy & all!! I do enjoy the way you have presented this specific matter plus it really does give us some fodder for thought. Nevertheless, through what I have personally seen, I just wish as other feed-back pile on that people today remain on issue and not embark upon a soap box of some other news of the day. Yet, thank you for this exceptional point and while I do not go along with it in totality, I respect your standpoint. Hi there I am so glad I found your webpage, I really found you by error, while I was looking on Aol for something else, Anyways I am here now and would just like to say thank you for a tremendous post and a all round entertaining blog (I also love the theme/design), I don’t have time to read through it all at the minute but I have book-marked it and also added in your RSS feeds, so when I have time I will be back to read a lot more, Please do keep up the superb work.